It’s 12 months since Jurgen Klopp took over from Brendan Rodgers at Liverpool and we’ve seen countless inspiring, emotional celebrations from the boss. In truth, there’s probably tonnes more we’ve forgotten about, but these six stuck in our minds, for all the right reasons. 6) Whenever we get a penalty! 5) Henderson’s screamer verses Chelsea this season! The skipper bags a beauty at Stamford Bridge and Klopp gets his pneumatic drill out on the touchline. Beautiful! 4) Benteke makes it 3-1 v Chelsea and confirms win over Mourinho! Klopp’s reaction for the first two is pretty relaxed, but by the third – he’s in the air. Mourinho’s glum face makes it all the best. 3) Milner’s TACKLE v Villarreal! Not strictly a goal, but when your manager celebrates a tackle as one, you can count it, right? 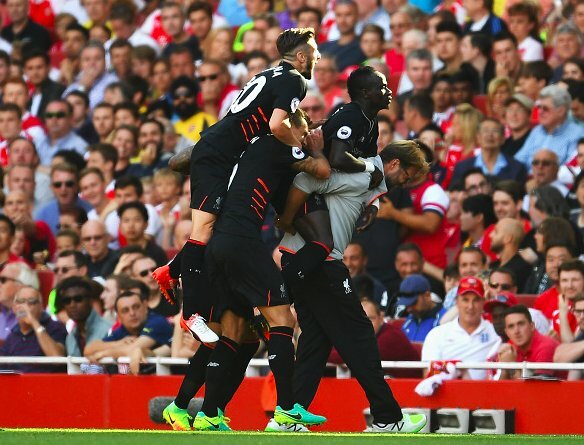 2) Klopp piggybacks Sadio Mane after Arsenal worldy! Klopp regretted this big time. Arsenal clawed the game back to 4-3, but at this point, we were 4-1 up and putting on a demolition job. His face afterwards is a sight, too. 1) Glasses are lost in manic Norwich bundle! The undeniable winner! Have you ever seen sheer, unadulterated like this after a goal’s scored? We haven’t.